The New Georgia monkey-faced bat (Pteralopex taki) is a fascinating species of flying-fox endemic to the New Georgia group of islands, in the Western Province, Solomon Islands. The genus Pteralopex is itself unique to the Solomon Islands with all five known species being listed as either Endangered or Critically Endangered under the IUCN RedList. In 1992, Diana Fisher and Liz Tasker traveled to Vangunu and New Georgia to study the ecology of P. taki (a then undescribed species). At the time of their study, New Georgia monkey-faced bats were not known to occur on Kolombangara Island. Being a large island, connected to New Georgia during the last ice age, it was reasonable to assume the species should also occur on Kolombangara. Hence, Diana and Liz surveyed two sites – Vanga (a vocational school on the north west coastline) and a site inland from Hunda and Kena villages on the western coastline. Despite their best efforts, the two researchers were unable to capture any monkey-faced bats on Kolombangara. They interviewed local informants who told them that indeed the species had once occurred there. However, they also relayed that the species had now become extinct. Kolombangara was extensively logged by Levers Plantations from the 1960s onwards, with much of the original lowland forest subsequently replaced by forestry timbers. Locals suggested that this loss of all primary lowland forest below 400m altitude had also effectively wiped out the New Georgia monkey-faced bat from the island. In February 2015, as part of a project to resurvey Diana and Liz’s 1992 field sites, I was lucky enough to visit the Vanga and Hunda/Kena sites on Kolombangara. This time I was joined by two rangers from the Kolombangara Island Biodiversity Conservation Association (KIBCA). Vanga is the site of a vocational school that provides training in agriculture, mechanics and carpentry to students from right across the Solomon Islands, from Shortland Islands all the way to Temotu. Upon arrival at the school, we were told that Diana and Liz’s 1992 survey site was adjacent to the model garden, where students learn agricultural techniques. 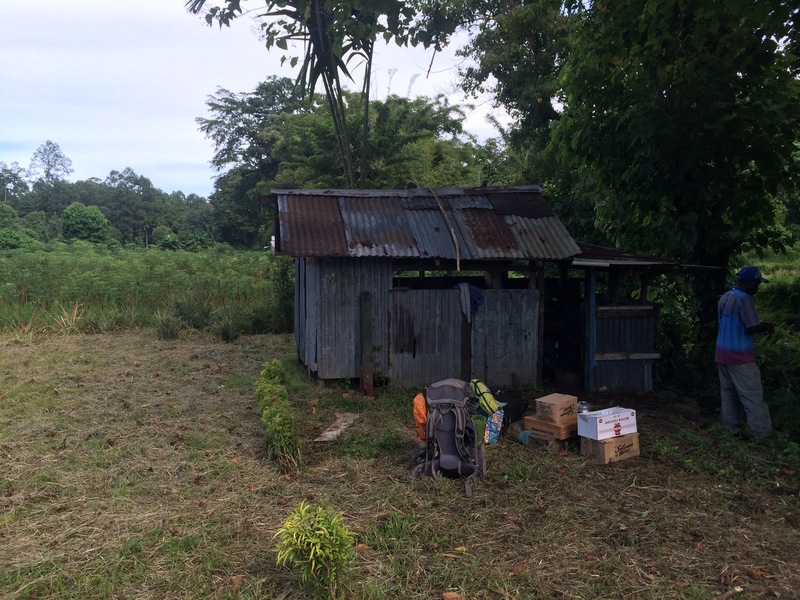 We were shown a nice place to camp and offered the use of a corrugated iron kitchen maintained by five boys from Shortland Islands. We set about finding a suitable location for our nets and immediately identified a semi-cleared ‘flyway’ at the interface of the garden and forest that would offer a nice place to net for flying-foxes. Being careful not to trample the swamp taro that had been planted in our chosen site, we set about suspending our nets on ropes from trees that were positioned either side of the natural gap in the canopy. 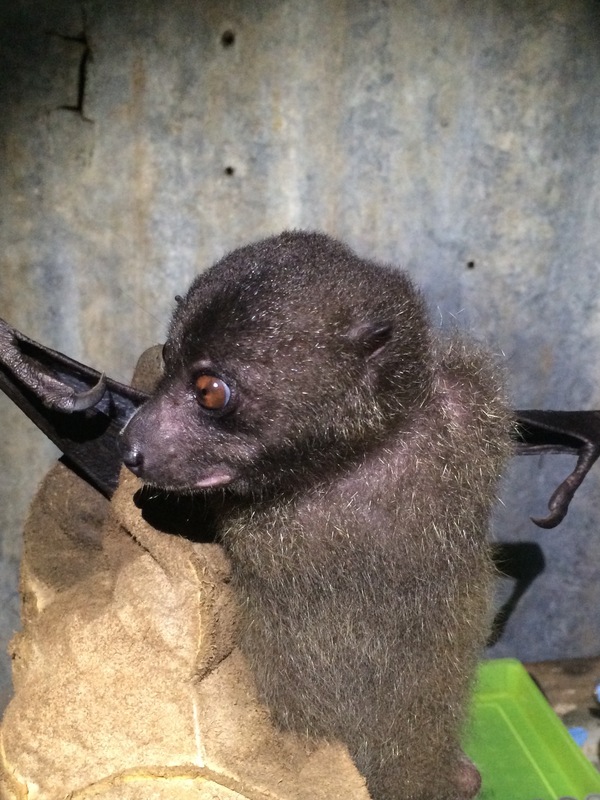 Our first check of the nets was a little disappointing – only two captures and both species that are commonly captured in mist nets in Solomon Islands (bare-backed fruit bat – Dobsonia inermis, and Admiralty flying-fox – Pteropus admiralitatum solomonis). We processed these animals and released them again at the point of capture. Our second check of the nets proved much more exciting. Again, only two captures but the characters of one individual immediately caught our eyes. Its broad square jaw, orange eyes and mottled white and black wings stood out clearly in the torch light – it was a monkey-faced bat! A New Georgia monkey-faced bat previously thought to be extinct on Kolombangara Island. Over the course of the week, we managed to capture six individuals. Unfortunately, we were not able to capture any at Hunda, but overall this was a remarkable result for a naturally uncommon species. Adjacent to the Vanga gardens there are several large strangler figs (the preferred roosting habitat for New Georgia monkey-faced bats). I believe these must be providing sufficient refuge for this species to persist in the fragmented environment. A variety of fruit and nut trees in the gardens also probably provide enough resources for monkey-faced bats to forage in the area. Having now completed all of the 1992 field sites, we can now begin to analyse the data and provide a better understanding of how flying-fox populations have changed between the 1992 and 2014/2015 surveys in the Solomon Islands Western Province.